Stocks are lower this morning on no real news. Bonds and MBS are up small. Donald Trump is suggesting that a new NAFTA could be in place by the end of the week. One sticking point is removing a provision that inhibits the US from pursuing anti-dumping and anti-subsidy cases. Mexico has agreed, but Canada is still fighting it. Initial Jobless Claims slipped 1K to 213,000 last week. Personal incomes rose 0.3% and personal spending rose 0.4% in July, which was right in line with estimates. The PCE inflation index came in at 0.1% MOM / 2.3% YOY, and the core PCE index rose 0.2% MOM / 2.0% YOY. Inflation is pretty much right at the Fed’s target, which means they don’t have to move quickly to increase rates and can still just gradually lift off the lower bound. A Reuters poll of real estate experts suggests that home prices will rise 6% this year and then begin to taper off the growth. Limited inventory has pushed up home prices well in excess of wage growth and inflation over the past 6 years. That sort of phenomenon can work when interest rates are falling, as the lower mortgage payment offsets the higher prices, but that game is over. Congress is entertaining legislation that will make it easier for self-employed borrowers to get a mortgage. The bipartisan “Self-Employed Mortgage Access Act” will address the needs of borrowers who don’t have traditional W-2 income. Sponsor Mark Warner said: “An increasing number of Americans make their living through alternative work arrangements, like gig work or self-employment. Too many of these otherwise creditworthy individuals are being shut out of the mortgage market because they don’t have the same documentation of their income – paystubs or a W-2 – as someone who works 9-to-5. This bill will allow these workers to supply other forms of paperwork to verify their income while continuing to protect consumers from predatory lending.” The bill will expand the universe of income documentation to allow these borrowers to fall under QM. The bill is supported by the MBA and the Consumer Federation of America. 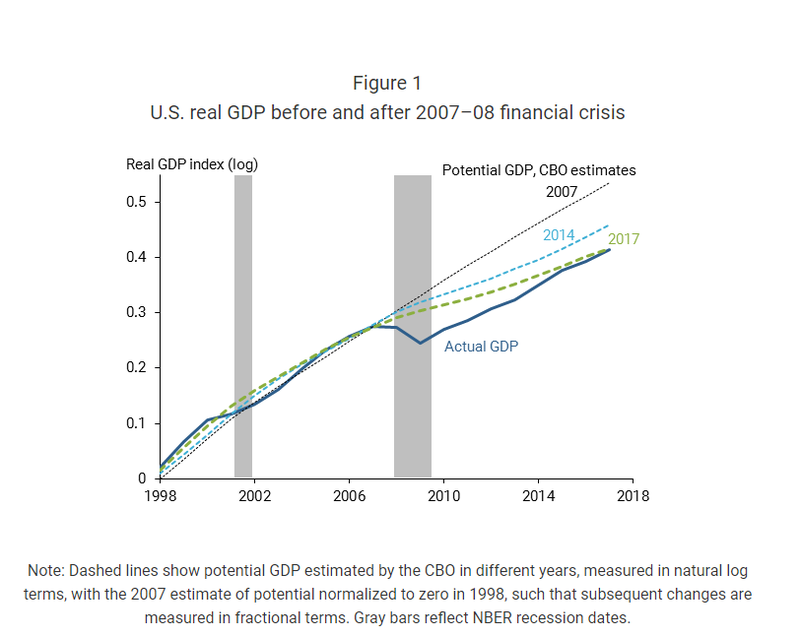 The Great Recession left what looks to be a permanent gap between potential GDP and actual GDP, which amounts to something like $70,000 per person. You can see the output gap in the chart below. Interestingly, the word “bubble” appears nowhere in the article – it is as if the financial crisis appeared out of nowhere, which certainly demonstrates a blind spot for the Fed (and central bankers in general). They don’t take into account that the trajectory of growth (beginning in 1998 through 2006) was artificially boosted due to increasing asset prices. The trajectory begins with the stock market bubble and ends with the real estate bubble. Granted the late 90s growth was also influenced by a boom in productivity, but that ended soon after. I always find it interesting that central bankers believe “too much money chasing too few goods” (i.e. inflation) is a monetary phenomenon, but “too much money chasing too few assets” (i.e. asset bubbles) is not. Stocks are flat this morning after GDP came in better than expected. Bonds and MBS are down small. Mortgage Applications fell 1.7% last week as purchases fell 1% and refis fell 3%. This is despite a drop in rates. Second quarter GDP was revised upward to 4.2% from 4.1%, which was higher than the street estimate of 4.0%. The main revisions were to consumption (downward) and fixed residential investment (upward). Inventories were a drag on GDP, which means that we should see a bump to Q3’s numbers. The GDP price index was also revised up a touch, from 1.8% to 1.9%. All of this provides a good environment for the Fed to ease back from the zero bound. Mortgage bankers made $580 per loan in the second quarter, an increase from $118 in the first quarter. Banks cut costs aggressively (dropping production costs per loan by about $1,000) however declining volumes offset that, and this turned out to be the weakest quarter since the MBA began keeping records in 2008. That $580 represents a profit of 21 basis points per loan, which was a drop form 24 bps a year ago. Fee income dropped to 341 bps from 370 in the first quarter. Refis continue to decline, with purchases accounting for 81% of all volume. Here is something wild. Last night, there were no trades in the JGB market (the world’s second largest bond market). This is the 7th time this has happened this year. The Bank of Japan basically controls the market, and trading has dried up. We live in interesting times, at least if you are a central banker. Pending Home sales fell 0.7% in July, according to NAR. Lawrence Yun, NAR chief economist, says the housing market’s summer slowdown continued in July. “Contract signings inched backward once again last month, as declines in the South and West weighed down on overall activity,” he said. “It’s evident in recent months that many of the most overheated real estate markets – especially those out West – are starting to see a slight decline in home sales and slower price growth.” Blame tight supply, which has driven up prices to unaffordable levels. The housing slowdown has not been lost on the stocks of the homebuilders, who despite strong earnings (and an incredibly strong stock market) are down 14% YTD. At some point, the sector will be unable to rely on increasing ASPs and will have to pump up volume to show growth. Despite the clear need for new housing, especially at the starter level, builders seem content to meter their growth and plow excess cash into buybacks. Stocks are higher this morning on optimism over trade talks with Mexico. Bonds and MBS are down. We saw a strong buildup of inventory in July, both at the retail level and the wholesale level. Inventory growth was negative in the second quarter, which depressed GDP growth slightly. This improvement in inventories will provide a boost to the third quarter numbers. Durable goods and autos led the increase, with retail inventories up 0.4% and wholesale inventories up 0.7%. Redbook reported that same store sales rose 5.1% last week, which was the third fastest pace this year. This bodes well for the back-to-school numbers which are the best predictors of the holiday shopping season. Consumption has been generally strong and these numbers bear that out. Consumer confidence jumped to 133.4 in August according to the Conference Board. This is the highest level since late 2000. House prices rose 6.2% in June, according to the Case-Shiller home price index. Las Vegas, San Francisco, and Seattle reported double-digit increases. The laggards included New York, Chicago and Washington DC which reported low single-digit gains. Las Vegas is one of the fastest growing US cities in terms of population and employment growth, which explains the rise there. Seattle and San Francisco has restricted supply along with foreign demand. On the other side, the Northeast continues to stagnate. The Urban Institute looked at mortgage denial rates along demographic lines and found that most of the studies that report discrimination overstate denial rates because they fail to take into account incomes and credit scores. While they still found some evidence of racial disparity it is much lower when you correct for these things. Not sure if the difference is statistically significant though. Given that CRA loans are worth more than traditional loans (all things being equal) it is surprising that there is any difference at all. As the long end of the curve continues to rally, we will have a steady diet of recession prediction stories in the business press. The latest Reuters story cites a Federal Reserve study that suggests the market may be warning of a potential recession: “In light of the evidence on its predictive power for recessions, the recent evolution of the yield curve suggests that recession risk might be rising,” wrote San Francisco Fed research advisers Michael Bauer and Thomas Mertens. The flattening yield curve provides plenty of fodder for the Wall of Worry, however there are a couple of things to bear in mind. First, the yield curve almost always flattens during a tightening cycle. Take a look at the chart below, and you can see the yield curve flatten as short term rates rise. The behavior of the yield curve is 100% normal. Not only that, longer term interest rates are being held artificially low due to the behavior of central bankers throughout the world. The Fed is still buying Treasuries, albeit at a slower pace, while Japanese and European central bankers are pushing down long-term rates, which influences US rates. The signal-to-noise ratio of the yield curve is extremely low right now. Finally, the short Treasury trade is probably the biggest macro bet on the Street right now. Every wiseguy is short, and that means you will sometimes get these rallies for no apparent reason. Stocks are higher this morning on news that the US and Mexico might strike a deal on NAFTA. Bonds and MBS are flat. We should have a quiet week heading into the Labor Day weekend. We will get GDP on Wednesday and Personal Incomes / Personal spending on Thursday and those are probably the only potential market-moving reports. Mohammed El-Arian believes there is a 60% chance that Trump’s hard line on trade will result in a better deal for the US. There is a 15% chance that Trump’s stance could result in a beakthrough with China (similar to Reagan’s approach with the USSR during the Cold War), and another 25% chance that we go into a full blown trade war. He stressed that the US’s role as the world’s biggest consumer matters: “I’ve said from day one, it’s just a matter of time until other countries realize that their best approach is to collaborate with the U.S. and fix things that are broken,” El-Erian said. Moody’s downgraded Chase’s jumbo underwriting rating to “above average” from “strong” based on concerns over the percentage of loans that come from its delegated correspondent channel. Moody’s also dinged them over their proprietary LOS (licensed from Quicken), disliking the look and feel of it. Chase obviously disputes the downgrade, and defended their underwriting. “We respectfully disagree with the rating and feel it’s based on insufficient information. While we provide select correspondent lenders with delegated underwriting authority, we also then conduct individual underwriting reviews on roughly half of those loans. These are high-quality loans that perform well,” Amy Bonitatibus, chief marketing and communications officer of Chase Home Mortgage, said in an email. Elon Musk ended his proposed buyout of Tesla late last week. The Street never took it seriously to begin with, and was highly skeptical of his claim that funding for the deal was secured. The SEC is investigating the “funding secured” comment, which sounds like it was based largely on the existence of a pitch book, not any sort of letter from an investment bank (not even a “highly confident” letter). Layoffs continue in the mortgage biz. Wells let go 600 people, mainly in servicing and retail fulfillment. Lower volumes and margins contributed to a 33% drop in mortgage banking income for Wells in the second quarter. Economic activity decelerated in July, according to the Chicago Fed National Activity Index, which is a meta-index of 85 economic indicators. Production-related indicators decelerated, while employment-related indicators improved. The 3 month moving average fell as well. Another slow news day. Low level talks between China and the US over trade didn’t really go anywhere. Durable Goods orders fell 1.7% in July on weak aircraft orders, but the core capital goods rate jumped 1.4%, which shows another month of strong business investment, particularly business equipment. Many economists had been skeptical that cutting corporate taxes would increase capital expenditures, but it looks like it has. Theory certainly predicted it would. Jerome Powell is speaking in Jackson Hole this morning. There probably won’t be anything market moving, but just be aware. The conference will focus on a academic papers for the most part. The agenda is here. One of the papers argues that the Fed should continue to hike rates, even in the absence of current indications of inflation, if the unemployment rate is below the long-term sustainable rate. Since monetary policy acts with a lag, a low unemployment rate can increase inflationary pressures before monetary policy takes effect. The Fed faces two major risks of “moving too fast and needlessly shortening the expansion, versus moving too slowly and risking a destabilizing overheating,” said Mr. Powell. “I see the current path of gradually raising interest rates as the [Federal Open Market Committee’s] approach to taking seriously both of these risks. In other words, expect maybe 2 more hikes this year, and maybe one or two more next year. The central tendency seems to be 2 more hikes this year, one more next year, and then the Fed takes a break. Slightly more people think the Fed stops after 2 hikes than those who think the Fed does 4 or more. St. Louis Fed President James Bullard would vote to maintain the current Fed Funds rate through the end of the year. 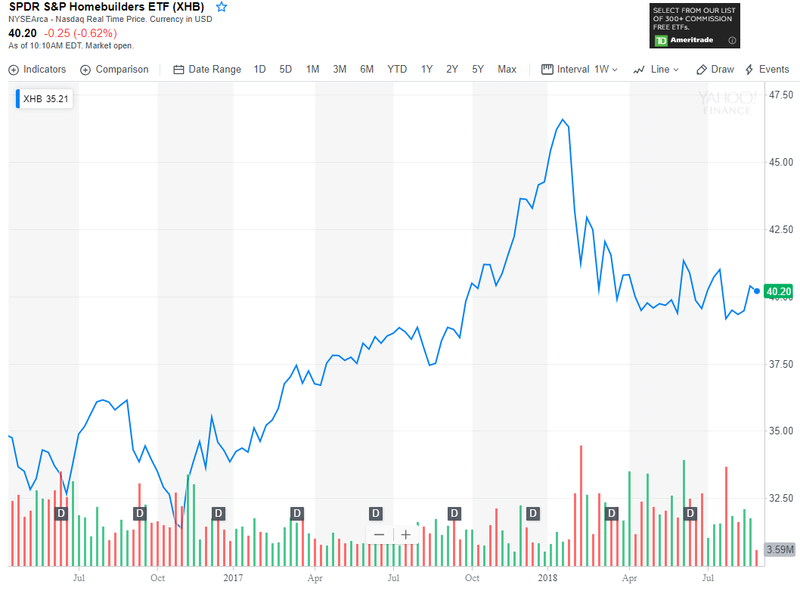 “If it was just me, I’d stand pat where we are and I’d try to react to data as it comes in,” he said Friday in an interview with CNBC’s Steve Liesman. “I just don’t see much inflation pressure. … I’m an inflation hawk, but I just don’t see that developing. … I just don’t think this is a situation where we have to be pre-emptive.” He also sees the economy slowing next year, and in 2020. The Senate Banking Committee voted 13-12 along party lines to advance the nomination of Kathy Kraninger to run the CFPB. Remember if Kraninger is rejected, Mick Mulvaney continues to run the agency, which was probably the plan all along. The FOMC minutes didn’t offer anything too surprising. Most participants said it would be appropriate to raise rates soon, which wasn’t a surprise – the Fed Funds futures have a Sep hike as pretty much a sure thing. They worried about how trade could be a downside risk to the economy, especially if it affects business sentiment, investment and employment. They mentioned that in the “not too distant future” monetary policy will no longer be viewed as accomodative. This statement seems to hint that rate hikes should wind up next year, provided inflation remains around these levels. Note that the head of the Dallas Fed suggested that the tightening cycle might be done once we get 75 – 100 basis points higher on the Fed Funds rate. Bonds didn’t react to the minutes at all, and the Fed Funds futures didn’t budge either. There wasn’t much talk about reducing the size of the balance sheet, which is more or less on autopilot right now. As the yield curve flattens, you would think the Fed would consider getting more aggressive on the balance sheet unwind. Maybe not on the mortgage backed securities side, but on the Treasury side. If credit is still widely available and the demand is there, why not? If the ducks are quacking, feed ’em. Central Bankers are meeting in Jackson Hole today. There usually isn’t much in the way of market-moving statements out of these things, but just be aware. Initial Jobless Claims fell to 210,000 last week. We are bumping around levels not seen since 1969. When you consider the fact that the US population was only 200 MM back then (compared to 325 MM today), it is even more impressive. It certainly has economists scratching their heads. Home prices rose 0.2% in June and 1.1% for the second quarter, according to the FHFA House Price Index. The second quarter’s pace was the slowest increase in 4 years, which shows that higher interest rates are beginning to have an effect on prices. Prices did rise in all 50 states and 99 out of 100 MSAs. 5 states (NV, ID, DC, UT, and WA) had double digit increases. The Las Vegas MSA had the biggest increase – almost 19%. The laggards were CT, AK, ND, LA, and WV. Heidi Heitkamp, a moderate Democrat from North Dakota says she will not support Kathy Kraninger to run the CFPB. She said she was inclined to vote yes, however she is concerned about Kraninger’s experience in consumer protection and also felt she “lacked empathy” for consumers and didn’t believe in the Bureau’s mission. Heitkamp has been supportive of regulatory relief, which means she was a gettable vote. Kraninger’s nomination looks largely to fall along partisan lines now. New Home Sales fell 1.7% MOM to 627,000, which was below the Street estimate of 649,000. It is up 12.8% on a YOY basis however. The new home inventory situation is getting more balanced, with 5.9 month’s worth of supply. As always, the question is whether that inventory represents the oversupplied luxury market or the undersupplied starter market.